"The fool has said in his heart, 'There is no God.'" (Psalm 14:1; 53:1). Even a cursory glance over the information available in the various forms of media reveals that a great deal of time and energy is spent attempting to prove the existence of God. This is especially true in the midst of the creation vs evolution debate. And yet it was not always this way. In the early days of the church there were very few people who denied the existence of God, hence the designation of those who did as "fools." Without exception the early fathers of the church wrote and taught from the premise that there definitely is a god, the only questions up for debate were: Who is the true God, and, Is there more than one? That is, until a monk named Anselm came along. Anselm was born in 1033 near Aosta, in Italy. We know very little about his early life, other than he left home at twenty-three, and after three years of apparently aimless travelling through Burgundy and France, he came to Normandy in 1059. Next, Anselm entered the Bec abbey as a novice and excelled under the tutalage of Lanfranc, Bec's prior and a teacher of wide reputation, under whose leadership the school had become an important center of learning. Anselm's intellectual and spiritual gifts brought him rapid advancement, and when Lanfranc was appointed abbot of Caen in 1063, Anselm was elected to succeed him as prior at Bec. He was elected abbot in 1078 and under Anselm's leadership the reputation of Bec grew even more as Anselm writings in philosophy and theology, drew the attention of rulers and nobles all over Europe and beyond, who sought his advice and counsel on a variety of matters. That was what brought Anselm to England in 1092. Hugh, Earl of Chester, had sought his advice about a monastery he wanted to build, but Anselm was reluctant to go because there were rumors around that he was on the short list to succeed his mentor Lanfranc as the archbishop of Canterbury. Lanfranc had died three years earlier but King William Rufus was keeping the see open because as long as he avoided appointing a new archbishop, the monies slated for the office went into his pocket instead. A violent illness which brought him to death's door frightened Rufus into changing his mind. When he recovered, he nominated Anselm archbishop of Canterbury, issued a proclamation against various abuses, and promised that in future he would govern according to law. Anselm was still reluctant to accept the honor, but after much negotiation, which included returning to the see of Canterbury all the lands which had been taken from it since the days of Lanfranc, he was consecrated at Canterbury on December 4, 1093. But being Archbishop of Canterbury is not why Anselm is remembered. Despite the requirements of his various offices he never stopped pursuing philosophy and theology. As it the volume of work in produced in this regard that for which he is most well known and for which the church is most thankful. Can the existence of God be proven? Anselm thought so. Modern philosophers and theologians disagree; however, it is Anselm's argument, known as the ontological proof, which remains the most troublesome for them. In order to discuss the existence of God, we first need to define him. In general he is defined as a perfect being, greater than anything else which can be imagined. If God does not exist, then the name "God" refers to an imaginary being. This makes the definition of "God" contradictory, since in order to be "greater than anything else that can be imagined" God would have to be real, living, and have power, all of which is not available to the imaginary. The upshot of this is we cannot even discuss the word "God" as defined if he does not exist, because I have to conceive of him as really existing in order for him to be greater than anything else, for a God who does not exist is not greater than anything else. In other words, no philosopher can legitimately argue that God does not exist if said philosopher defines God as a perfect being greater than any which can be imagined; because to be perfect, God must have real existence. Philosophers who acknowledge His existance do not have a problem with self-contradiction. So... since we can indeed raise the question of God's existence and argue the point, then God must exist. As a theologian, Anselm is remembered for his book, Why Did God Become Man? In it he argued that each of us has run up such a debt of sin that there is no way we can repay God. Christ, as infinite God, has merit enough and to spare to pay our debts. As a scholar, Anselm argued that we must believe in order to understand. He wrote: (translated from the Latin) "Nor do I seek to understand that I may believe, but I believe that I may understand. For this too I believe, that unless I first believe, I shall not understand. But after the faith is held fast, the attempt must be made to demonstrate by reason the truth of what we believe. Indeed, it is wrong not to do so: I hold it to be a failure in duty if after we have become steadfast in our faith we do not strive to understand what we believe." In modern terms we might say that truth only begins to comes clear when one is committed to it. You cannot see around a bend in a trail unless you walk toward it. When Anselm died he was surrounded by friends who declared to the world the church was poorer by a great mind and England by a zealous reformer. It is generally believed that he was canonized in 1494, although there is debate whether this occurred at all. Regardless, Anselm will long be remembered as one of the great thinkers of the Christian world. 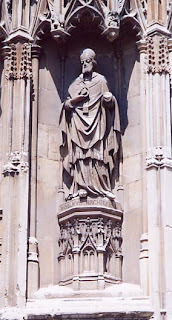 Anselm (pictured is his statue at Canterbury) died April 21, 1109 – 898 years ago this week. Other events that happened this week. April 15, 1415 - Jerome of Prague is seized by church authorities meeting at the Council of Constance. Under duress, Jerome recanted his Wycliffe-influenced beliefs and accepted the authority of the pope. When a crowd was assembled so he could repeat the recantation publicly, he changed his speech and eloquently defended Wycliffe's teachings. Jerome was subsequently burned at the stake. April 16, 1905 - In St. Petersburg, Christian leaders are summoned to the Palace of Princess Lievan. They are presented with a manifesto of religious tolerance relieving the suffering Christians had been under for over 200 years. As good as the news was, it didn't last. Nicholas II was one of those world leaders who broke his promises almost a soon as he made them. This helped play into the hands of the revolutionaries who eventually toppled him, the last Tsar, from power. April 17, 1937 - With Mussolini's troops occupying Ethiopia, Sudan Interior Mission missionaries who had started a small church among the previously devil-worshiping Wallamo tribe are forced to leave the country. "We knew God was faithful," one missionary wrote. "But still we wondered—if we ever come back, what will we find?" The missionaries returned in July 1943 to find that, despite severe persecution by Italian soldiers, the Christian community had grown from 48 members to 18,000. April 18, 1587 - English Protestant historian John Foxe, author of Actes and Monuments of Matters Happenning to the Church (the shorter version is now known as Foxe's Book of Martyrs), dies at age 71. April 19, 1529 - At the Diet of Speyer (Germany), princes and 14 cities draft a formal protest of Charles V's attempt to crush Lutheranism, defending religious freedom for religious minorities, e.g. those involved in the Reformation movement. From then on, the Reformers were known as Protestants. April 20, 1233 (some say 1232) - Pope Gregory IX appoints full-time papal inquisitors and gives the Dominican order authority to carry out the Inquisition. For their vigilant and persistant work, the order won the moniker "Domini canes" or "God's dogs."